Perfect little drawstring bag to store small toys in. This hot pink bag has a multi stripe top, double drawstring for easy use and has been fully lined. Lining Colour: Electric Blue. A well constructed and durable bag. 100% cotton. Size: 20cm W x 26cm H.
Girls love trinkets and this small drawstring bag would be great to keep those little treasures safe.. This extra small drawstring bag depicts a pirate with his parrot on his shoulder. 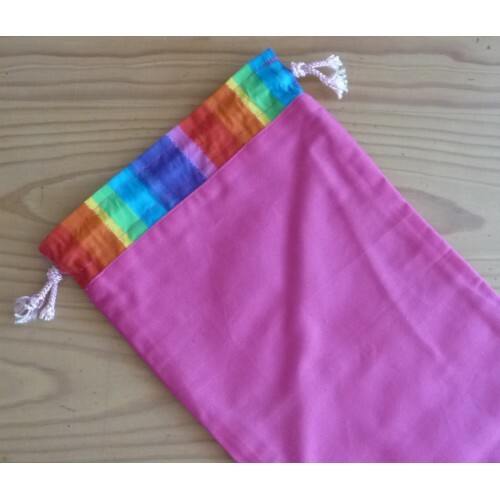 Keep all you..
For that little girl that loves pink, this drawstring bag is the perfect size to hold all those litt..